A few months ago, I was absolutely heartbroken when I found out that The Cheese Steak Shop would be closing the doors of their branch along Arnaiz Avenue - The same street wherein I work. Although it still was quite a bit of a walk to get there, the mere thought of being unable to visit their restaurant for some of their mouthwatering Cheese Steaks nearly brought tears to my eyes. I had heard that they would be moving to a new branch at The Fort. The Cheese Steak Shop would be my "Go-to" place whenever I need I need a quick solution to a client dropping by, and we need a no frills, yet impressive meal for them to dine on while they're in our office. You wouldn't think a simple sandwich would be so well received, but then again, their Cheese Steak isn't just a "simple sandwich". Last year, when I heard they were moving, I decided to make the walk to the Cheese Steak Shop to say one last goodbye. With a heavy heart, I ordered my Bacon Cheese Steak (Default), and let out a deep sigh. I couldn't take it any more, so I as I was standing at the counter, I couldn't help but share my feelings with the cashier. I said, "I can't believe you guys are moving to The Fort! It's so far away from my office! I really don't want you guys to leave!" Jokingly, I even offered, "Let me talk to your boss! I'll convince her to let you guys stay!". She smiled and said, "Actually Sir, we're just moving to another branch in Amorsolo Avenue. When you get to the stoplight of Amorsolo and Arnaiz, just turn right. Go a few meters down, and you're there!". All of a sudden it hit me. The new location is actually nearer to my office then this branch was. So naturally my next response was, "Can I help you pack?" Don't be fooled by the title of this post. Since The Cheese Steak Shop has moved, I've been to their restaurant quite a few times, and I've managed to explore their menu.. But truth be told, I keep going back to their Bacon Cheese Steak, with their Amoroso rolls, which wasn't there during my first trip, taking the sandwich to an entirely different level. 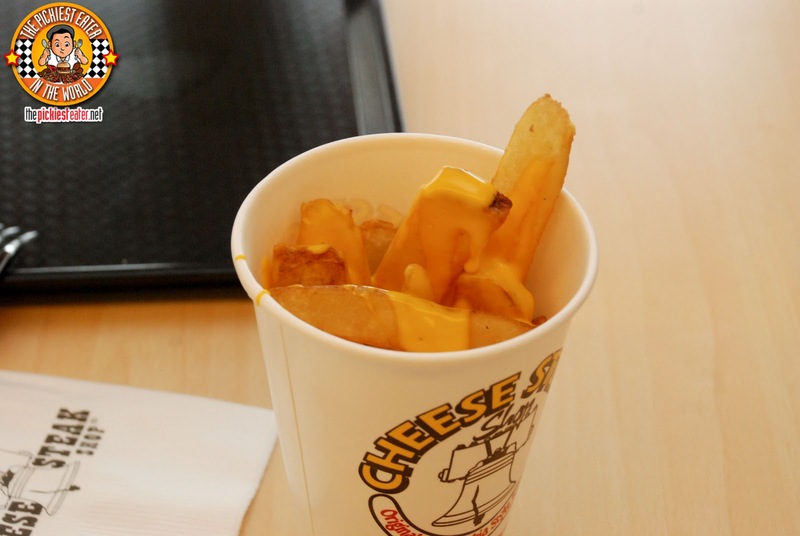 I've always said that I'm not a big fan of thick cut steak fries, but Cheese Steak Shop's Cheese Fries (P99 Reg/ P135 Lrg) is an exception. Despite being thicker than the norm, it still had that nice crunch that I look for in my fries. And the drizzling of cheese was absolutely divine. 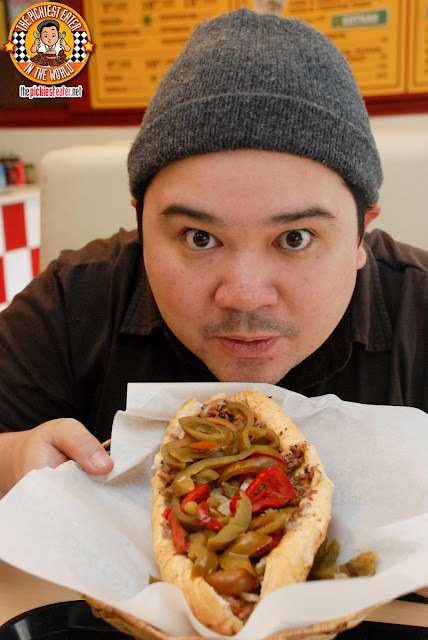 The Cheese Steak that you saw me holding up in the cover photo was the King Of Philly (P699), which is their take on the classic Cheese Steak. 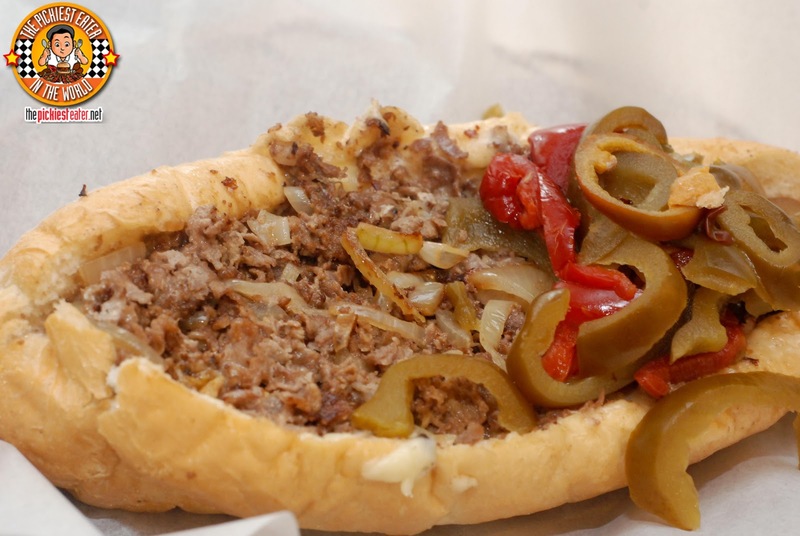 It's 10 inches and is packed with 50% more meat and cheese than the other premium Cheese Steaks on their menu. I liked this with a bit of their Ranch Dressing, and I learned that it is best to have all the peppers on the side, so that it doesn't overpower the flavor of the beef. I'm fairly certain that Rina got her point across in the previous post, where she declared that she loves breakfast. The same rings true for me both, especially since Bacon is known to be a breakfast staple.. Well for ME at least. The Cheese Steak Shop gives you an opportunity to "Breakfastsize" your any of your cheese steaks, simply by adding (P100) to it! 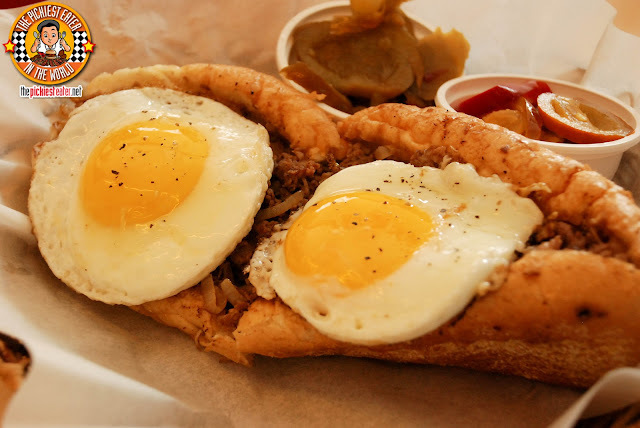 Two sunny side up eggs were neatly placed on top of my Bacon Cheese Steak, and now, I don't think I can eat it any other way. I had them make sure that the yolk was still runny, just the way I like it. I pierced the top of the yolk, and let it mix into the flavors of the beef, and it worked together phenomenally (I again had them to put the peppers on the side). 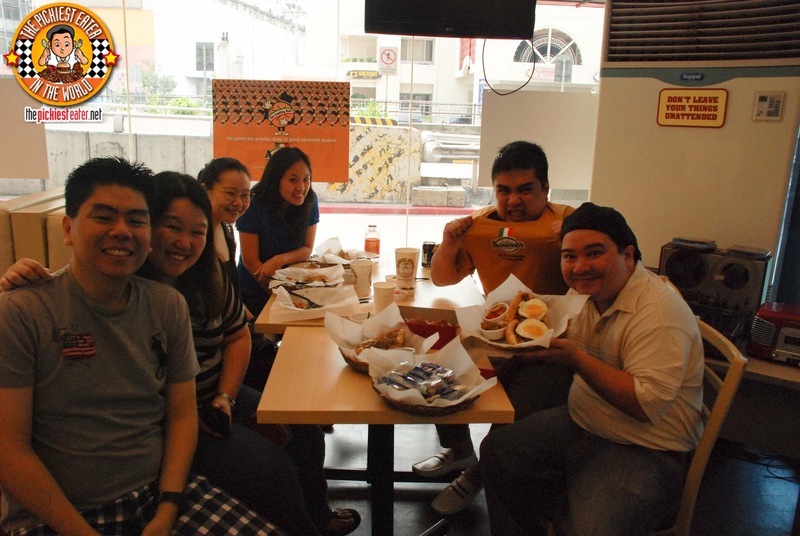 I was also excited to try the French Dip Cheesesteak (P320 7-inch, P520 10 Inch, P850 15 Inch). 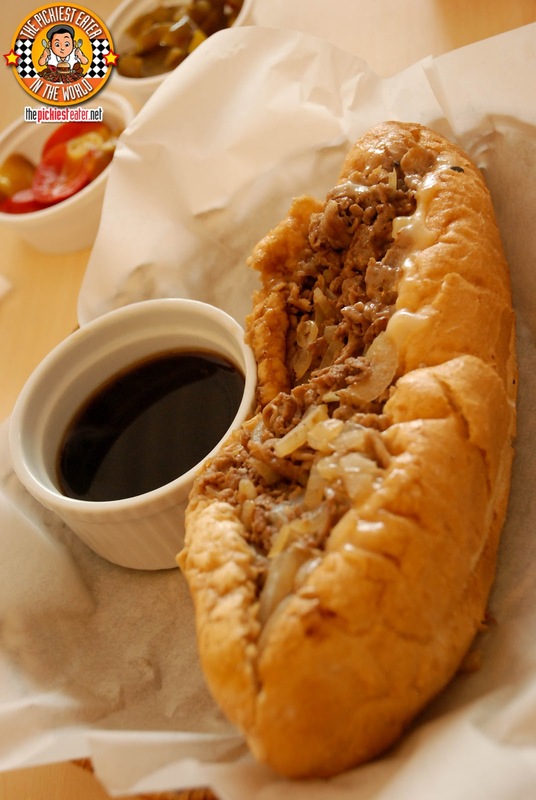 The cheese steak comes with a side of the beef's own drippings.. or "Au Jus" as we call it in France (Sacre Bleu!). Instead of the traditional American cheese, provolone cheese was used (which I prefer), and it was melted deep into the cheese to make some gooey, beefy goodness. 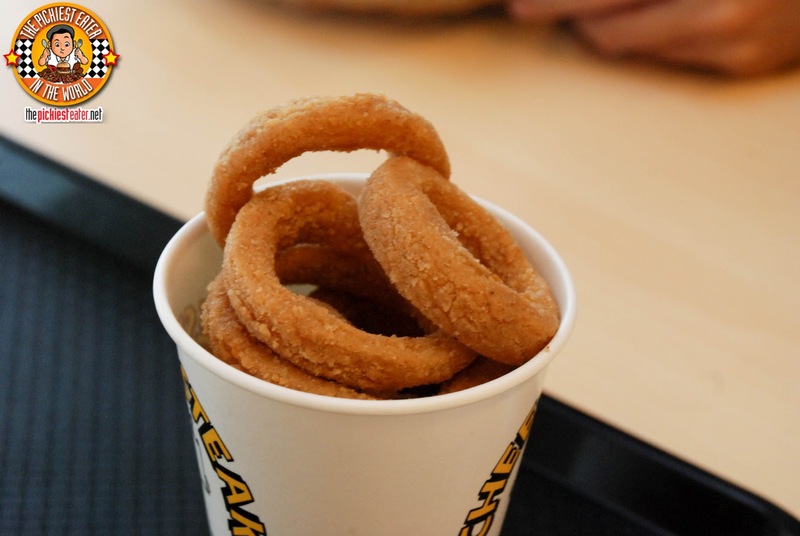 The natural flavor of the beef was augmented by it being bathed in its own juices and sauteed with bits of onion. For Dessert, I got to try some TastyKakes! 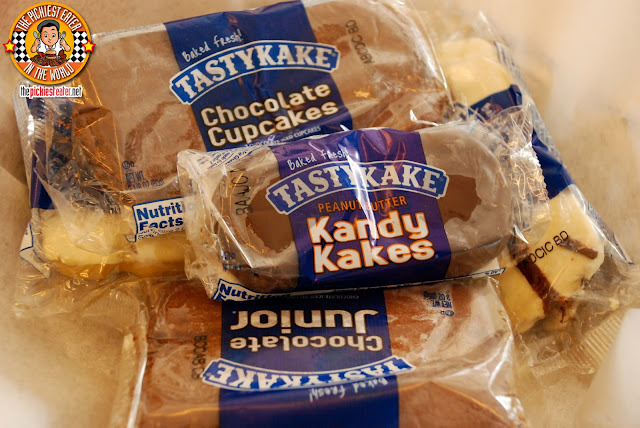 Since I was heartbroken over the demise of my beloved Hostess and their powdered Donettes, this was the next best thing! I didn't know they had different flavors, with my favorite being Butterscotch! That last trip to The Cheese Steak Shop was bittersweet, because as excited as I was to try the new dishes, it was also our small parting farewell to a blogger I've looked up to even before I began my site.. Frannywanny. We were all very sad, which is why in the picture above, our faces seem to be all red (From all the crying). When I go back to The Cheese Steak Shop, I'm planning on creating my own Cheese Steak (I'm still thinking of a name for it). But it's going to be The French Dip Cheese Steak with Egg and Bacon. Sounds awesome, doesn't it?